Recently the team at Evans asked me to style up an outfit to wear to a summer wedding. I decided to opt for something a little different from my usual 50s style floral numbers, and instead went with this sophisticated black shift that can be styled for a number of occasions. When I first moved to London I had no money. Like NO money! The recession had just hit, and jobs were scarce, and I got the only job I could find (paying minimum wage) and lived in a tiny little single room in the outer suburbs of London. My first year in London was an endlessly entertaining attempt at juggling an impossible budget. I worked with a wonderful bunch of people of equally meagre means, and our Friday nights out were usually fuelled by a bottle of wine purchased from the local off licence and smuggling it into a pub or bar so we could top up our glasses in the bathroom. Summer weekends were spent picnicking and swigging cider in parks, and enjoying the endless free entertainment London has to offer. While these are some of my fondest memories, at that time a new dress was an unheard of luxury, and every purchase had to be thoroughly justified as my budget just did not extend to much beyond a Primark pair of earrings. Weddings are always full of photos, so wearing a really statement dress can often leave you feeling like you can't really wear it again. Or at least not with that same group of people. We all love a new dress, but sometimes you just can't justify spending that money on something you can only wear a handful of times. When Evans asked me to put together a wedding outfit from their current collection, I wanted to pick something that would work for a wedding, but would be useful beyond that event. When budgets are a little bit tight, you just can't beat a little black dress (LBD). They can work for so many occasions, including weddings. The key for making your LBD work for a day event, is all in the accessories. For a cheerful celebration like a wedding I recommend taking your sophisticated LBD and injecting a bit of colour with your accessories. Evans' Black Lace Shift dress is a great example of a LBD which will work in numerous situations. The timeless shift style had a comfortable jersey lining, while the over is largely in lace. Adding mesh at the shoulders updates this little number so it's bang on trend for this season. On my 5'8 frame the lining hits me about halfway down my thigh, while the stretch lace sits just above my knee giving a pretty lace border. Here I am wearing the dress without tights but at a wedding (unless it was going to be super warm) I would probably wear them for the added layer to be honest - I just don't trust an English summer! Here I am wearing a size 22 (my usually size) which fits me comfortably - particularly as all the fabric is stretchy. I chose to pair the dress with some statement red heels. While the heel on these Red Suedette Cut Out Heels is reasonably low, they still give my legs that extra bit of definition I like in a shorter skirt. The cut out design is so striking I have had loads of compliments every time I've worn them, and as with all Evans shoes they are incredibly comfortable and come in a wide fit. I am size 8 usually and these fit me comfortably in an 8. As my ankles are quite slender I had to do the buckle on the side up to its tightest, but they are an incredibly comfortable fit - and this coming from a girl who rarely wears heels. 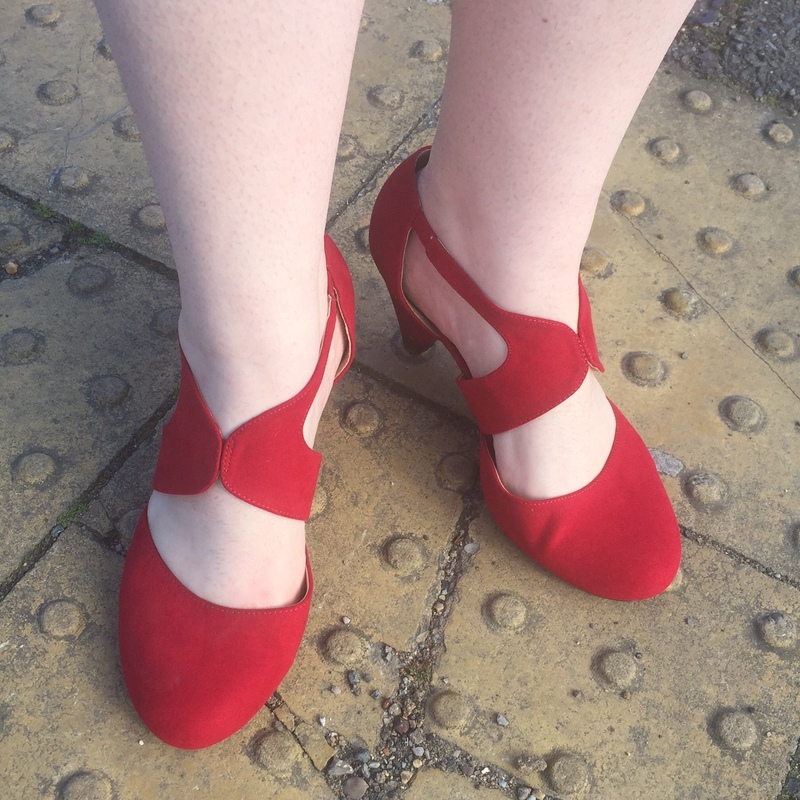 I would say the shoes are one of the stand out features of this outfit, and at £35 they are certainly cheaper than buying a new dress - so remember, when shopping for outfits for special occassions you can sometimes update something you already have with an unusual pair of shoes! 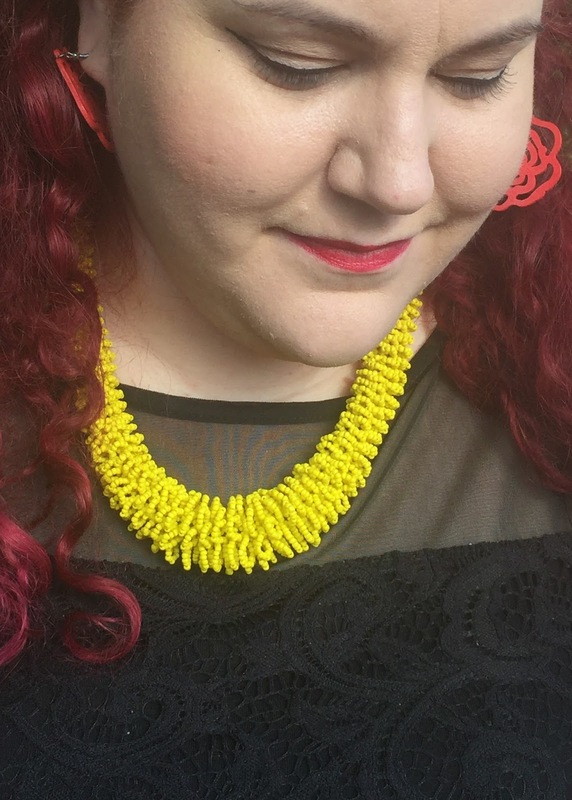 When putting together an outfit I usually like to add a third colour, so opted for some yellow jewellery from Evans' accessories collection. 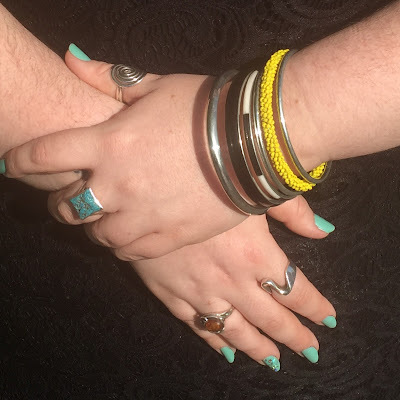 I love bangles, but having quite big (and certainly chubby) hands I usually really struggle to get them on if I buy them from places like Accessorize. The Evans accessories tend to be a more generous fit, which is great, so I went with a set of bangles in yellow, black and silver, as well as a yellow beaded necklace. The necklace is made up of lots of little beaded flowers all stacked together which is really sweet. I think the yellow works really well with the black and red. I topped my accessories off with a double yellow rose hair clip from Daisy Jean Floral (instead of a fascinator) and some red earrings I already owned just to balance out the red shoes. Now all I need to add is a hand bag in any of the chosen colours, and I'd be ready! Oh the LBD is gorgeous, I am a huge fan of lace! I like the pop of yellow and red, a colour combination that I wouldn't naturally go for however this totally works! I love some lace too. It's just so classic and classy! Love the colour pop with your bold accent colours! You look great. Love this look on you! The pop of colour is fantastic too! I need to go check out those shoes!! Fantastic outfit. Loving the accessories too. This dress fits you SO NICELY and I really love the lace on it! Your details are cute too and I love your little pops of colour on your accessories. I'd be proud to have you on my arm at a wedding! It's not my usual style but it was fun to try something different :) Wedding date!